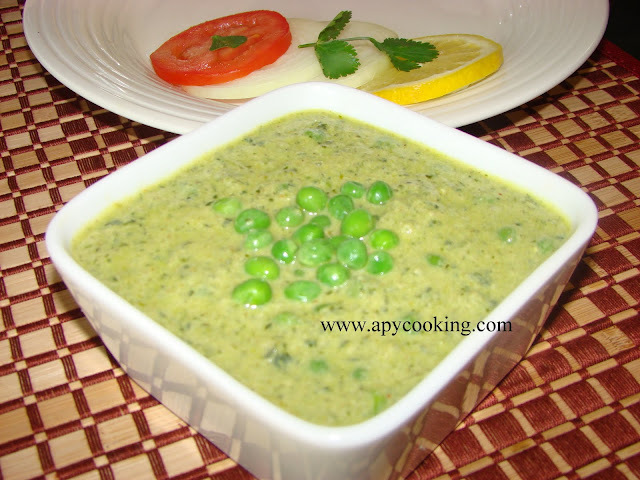 Methi malai mutter figures in my husband's list of most favourite dishes. So when my cousin, Aruna, gave me this recipe I tried it immediately. I have made it several times after that with some minor changes here and there. What I liked best about the recipe is that there's no 'malai' to be added, and the milk gives a creamy texture. Roughly chop onions, garlic and green chillies. Wash and coarsely chop methi leaves and coriander leaves. Heat oil. Saute onion, garlic and green chillies for a few minutes till onion turns brownish. Allow to cool. Transfer to a blender. Add all the powders and blend into a smooth paste (without water). In the same pan, heat 1/2 tsp oil and saute methi leaves and coriander leaves for 3 to 4 minutes. Add it to the above paste and blend for 6 to 8 seconds. [In the original recipe, you roast all the above mentioned ingredients together and blend them together into a smooth paste. However, I like to see little specks of methi and coriander leaves in the curry so I roast them separately and pulse them with the onion paste. 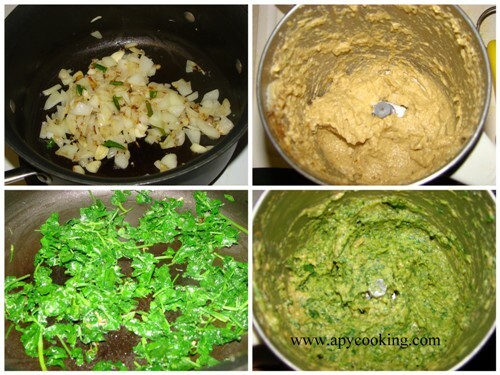 If you don't like the taste of tiny methi leaves, blend together into a smooth paste]. Heat 2 tsp oil in a deep-bottomed pan. Add maida and stir till oil and maida mix well, making sure no lumps form. When the mixture changes colour slightly, add the ground paste and roast for a minute. Add milk little by little and mix. [Add 1/4 cup milk at a time, mixing well with each addition]. Cook for 3 to 4 minutes till the mixture boils, keep stirring so that the paste doesn't stick to the bottom. 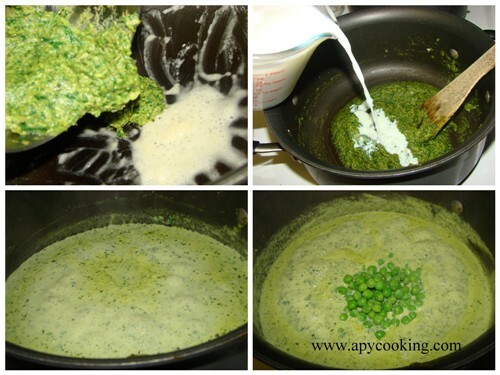 Add green peas and cook for a few minutes. Add salt to taste, sugar (to remove bitterness of methi) and juice of lemon. [ Note - I actually hesitate to use lemon juice because I'm scared it'll curdle the milk. I mentioned it here since it's included in the original recipe]. Add cubes of fried paneer if desired. Goes well with chapati, tandoori roti, naan or jeera rice. 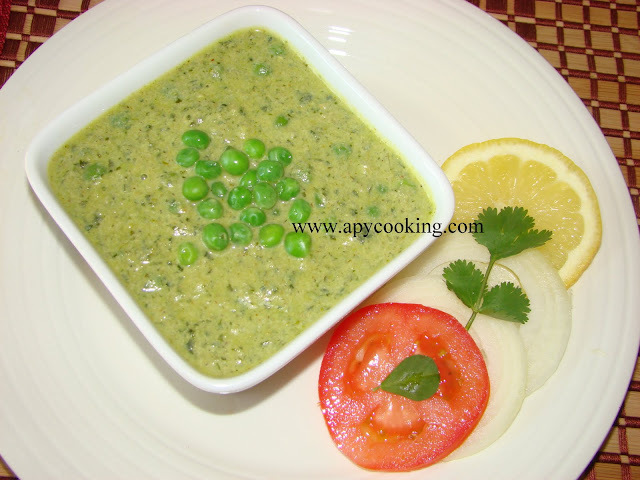 Methi malai mutter looks to be very tasty and colourful. Great preparation. very inovative...I'll love to try this.. It figures in my top favourite dishes too! Yum! :D In the beginning, it looks a bit like pesto. one of my fav dishes and ur version looks jolly good! Curry looks soo creamy and fantastic.. This is new combination....interesting to try! very innovative effort and creamy malai.love the combo. tried this recipe was soo delicious.. with chapati.. i didnt have methi.,. but i substituted that with spinach.. i also reduced the milk to 1\2 a cup ( didnt want too much of gravy ).. and dint use the sugar at all.. it was really good.. I omitted the lemon juice as i've had experiences of it curdling the milk..but on the whole very healthy! good job! Thanks for trying Michelle. The sugar is used incase methi leaves are bitter. wow! looks just like you get it in the restaurants. You have a great space here. Love all your pictures and the step by step pics make it look so simple. Great recipe! I have done this several times and each time it has been delicious.